Secret Forest Playschool is a nature preschool in Duluth, MN that opened in the fall of 2012 at the Eastridge Community Church. Playschool is dedicated to building a community with children and their families, that instills a lifelong love for play, a strong sense of self and a growing relationship with the natural world. Over the past four years the children that have attended Playschool have transformed the 30 acres of woods into a special place where memories are made and childhood is preserved. At Playschool children build fairy houses in The Fern Gully, splash in The Sparkling Creek, make forts in The Pine Tree Forest, eat vegetables that they planted in The Secret Garden and they gather to tell stories around a fire at The Outdoor Classroom. Playschool knows that although there are many places to learn, create and explore they are right where they belong. However, the sense of belonging that Playschool feels when they enter into The Secret Forest is something that is missing from their indoor classroom. Since opening Playschool has been renting a shared space at Eastridge, which has proven to be challenging at times. Every weekend Playschool's furniture, materials and belongings are stored away so their classroom can be transformed to meet the church's ministry needs. Then, at the beginning of the next week Playschool's space needs to be set up again so it ready for when the children arrive. So even though Playschool has developed a strong program, sharing a classroom with another program 3 days a week has left them longing for a sense of permanency. ​The exciting news is that Eastridge Community Church has started construction on a Cabin (just steps away from the Secret Forest) that Playschool will be moving into this spring! A portion of the new Cabin will have a classroom that will be dedicated entirely to Playschool, 7 days a week, giving the children and the program a forever home! ​The goal is that Cabin Classroom becomes an extension of the children's outdoor spaces. 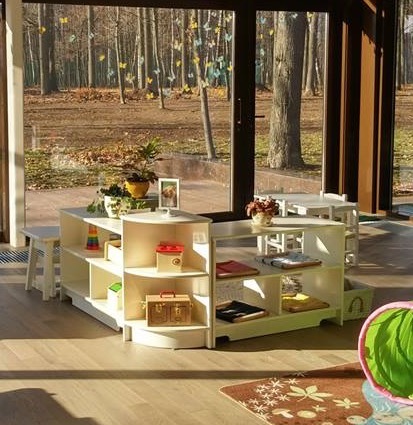 To complete the construction of the Cabin Secret Forest Playschool is customizing their classroom by creating an environment where their walls invite nature in and focus is on the making the space both function and sustainable. To accomplish this Playschool will be installing a 12' wide insulated glass panel garage door and a 16' wide section of glass doors that will complement their values by bringing in an abundance of natural light as well as allowing them to (literally) open their walls to the sights, sounds and smells of the Secret Forest! To satisfy Playschool's licensing requirements and to support function and long term sustainability of the program has decided to invest in connecting the Cabin to water and sewer for a bathroom and kitchen sink. "Fresh air, experience, trust and wholeness are the values that Playschool is built upon. Having a classroom that imitates that outdoor spaces that the children most naturally connect to is a dream come true" says founder and lead teacher Meghan Morrow. "Making these customizations [to the Cabin Classroom] will provide the children with a stimulating, comfortable and safe environment that will allow and encourage them to continue to learn, create and explore!" So now it's YOUR turn! Secret Forest Playschool needs YOU to help them complete the customizations for their new Cabin Classroom! This is an opportunity for the greater Playschool community, both near and far, to join us and make LASTING impact on all of the children that are or will be a part of the magic at Secret Forest Playschool! If we surpass our goal, which is possible, the additional funds will go towards building and purchasing classroom furniture and adding an outdoor patio complete with bird feeders, garden beds, picnic tables, and a fire pit.